A senior Indian army officer has been killed in an ongoing gun battle with militants in Indian-administered Kashmir. Major AK Thinge died after he and his men came "under heavy fire" in Poonch, an army spokesman said. Seven other soldiers, including a colonel, were injured. Despite a decline in violence in Kashmir in recent years, there are fears that militants are trying to regroup in the region. 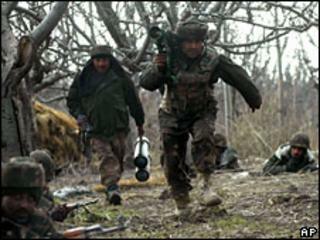 Hundreds of thousands of Indian troops are based in Kashmir to fight a two decade-old insurgency against Indian rule. An army spokesman said it was not clear whether the militants had crossed the Line of Control which divides Indian and Pakistani-administered Kashmir, and is close to the Beri Rakh region where the gunbattle is going on. "The operation will continue. We have tightened the security cordon in the area." He said the troops had come under heavy fire from the militants as they were preparing to launch an operation to flush them out.